Tasty organic spelt Italia sticks made with basil, tomato and sprinkled with gouda cheese. A delicious healthy snack for any time of the day. Spelt Wholegrain Flour* (62%), Vegetarian Gouda Cheese* (15%), Sesame Seeds* (12%), Tomato Puree* (3%), Sea Salt, Yeast*, Olive Oil*, Spelt Flour*, Speltmalt Flour*, Barleymalt Flour*, Oregano*, Paprika*, Basil* (0.1%), Acerola Fruit Powder*, Pepper*. Use with dips, such as pestos or hummus or enjoy on their own for a healthy snack. Not suitable for nut and soya allergy sufferers due to manufacturing methods. 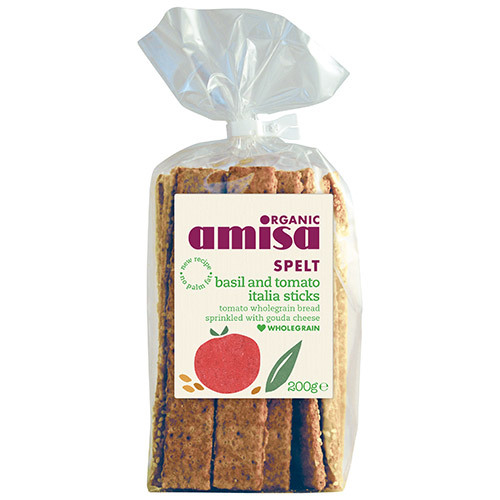 Below are reviews of Amisa Organic Spelt Basil & Tomato Italia Sticks - 200g - Best before date is 30th June 2019 by bodykind customers. If you have tried this product we'd love to hear what you think so please leave a review.